Posted on 15/09/2016 by Ian Grove-Stephensen Tagged assessmentbudgetbudgetingcostsmarkingsalariesvaluevalue for money	Comments2 Comments on How much does your school spend on marking? 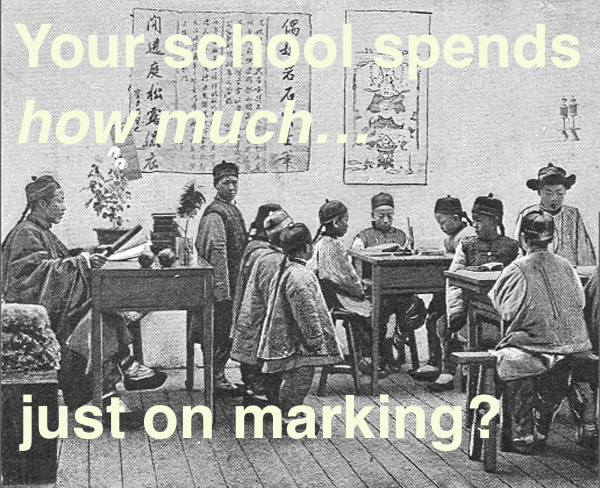 How much does your school spend on marking? I have yet to meet a single head or senior teacher who can answer this off the top of their heads, but it is easy to work out using government-published figures. Teachers work 55.7 hours/week total1, and spend 9.4 hours/week marking2. That’s 17%. The average teacher salary is £28,9513, but we have to add the employer’s NI contribution of 13.8% to give an employer cost of £32,946, ignoring all overheads. 17% of £32,946 of is £5,601. That’s what we spend on marking per teacher, per year. The average secondary school employs 654 qualified teachers, so the total cost per school is £364,053.